This post is sponsored by Atlantic Natural Foods. All opinions expressed are 100% my own. Big breakfasts can help lure even the sleepiest of sleepyheads out of bed at my house. That’s one reason we’re huge fans of hearty breakfast bowls. A big breakfast gets the day off to a good start. And they’re easy to change up according to what’s in the fridge. These Tex Mex Breakfast Bowls are better for you than any drive-thru breakfast and far more satisfying. They can be made ahead to pop in the microwave, or set out buffet style on mornings when there’s a bit more time for a leisurely breakfast. 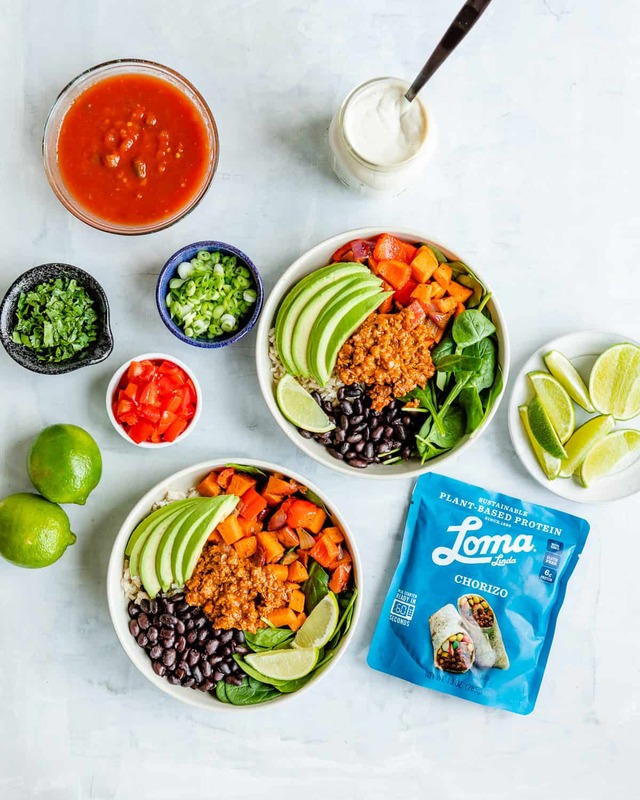 We’ve partnered with Atlantic Natural Foods, purveyor of high-quality plant-based products, using their Loma Linda Chorizo for these Texas-sized breakfast bowls. 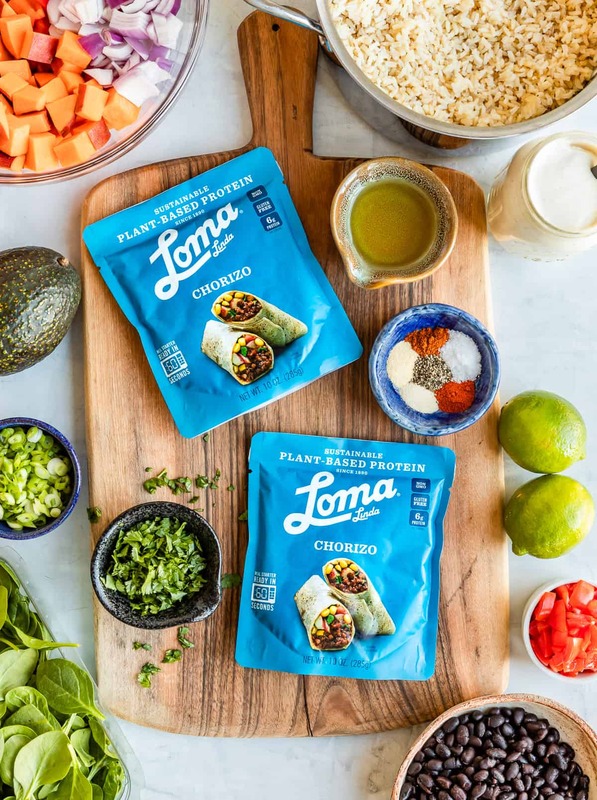 Plant-based Loma Linda products make better-than-the-real-deal substitutes for classics like taco filling, pad thai, and more. 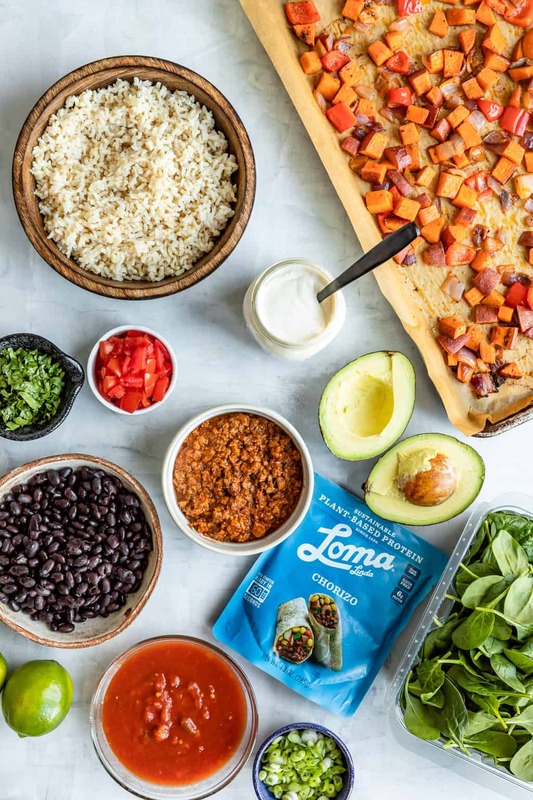 Their chorizo is a 100% plant-based, non-GMO, high in protein, free from cholesterol, artificial colors and flavors, and trans fats take on Mexican sausage. Plus it tastes amazing! It’s perfect for burritos, casseroles, tacos, chilaquiles, enchiladas, quesadillas, or anything you can come up with. The best part? The chorizo is packaged in shelf-stable pouches that are easily heated in 60 seconds – perfect for quick dinners and even camping. Start your prep by roasting veggies using a simple spice mixture that compliments the flavor of the chorizo. Veggies add some great colors, flavors, and textures to the breakfast bowls. While the veggies roast on high for 10-15 minutes, it’s easy to prep all of the other ingredients and toppings. You can heat the chorizo pouch in the microwave or in a pan of gently simmering water. I love that there are options! 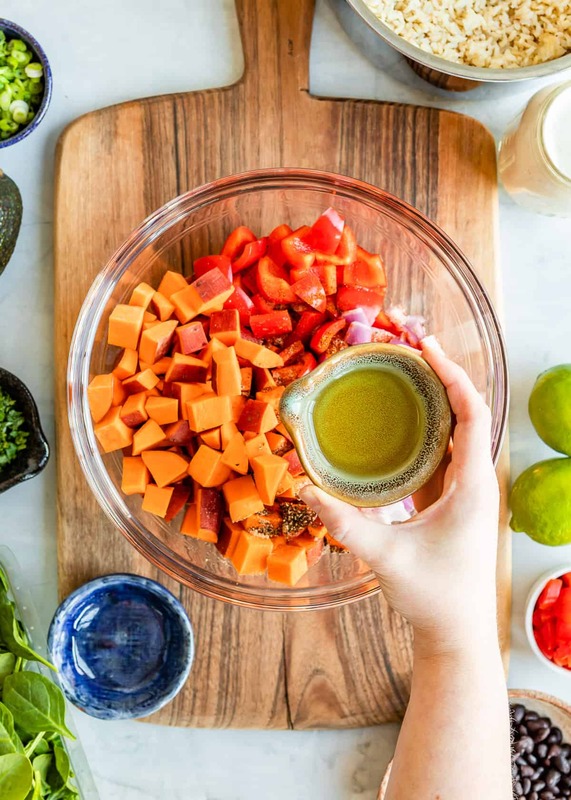 Once the veggies are tender and delicious, and all of the other stuff is prepped and ready, it’s time to build the bowls! 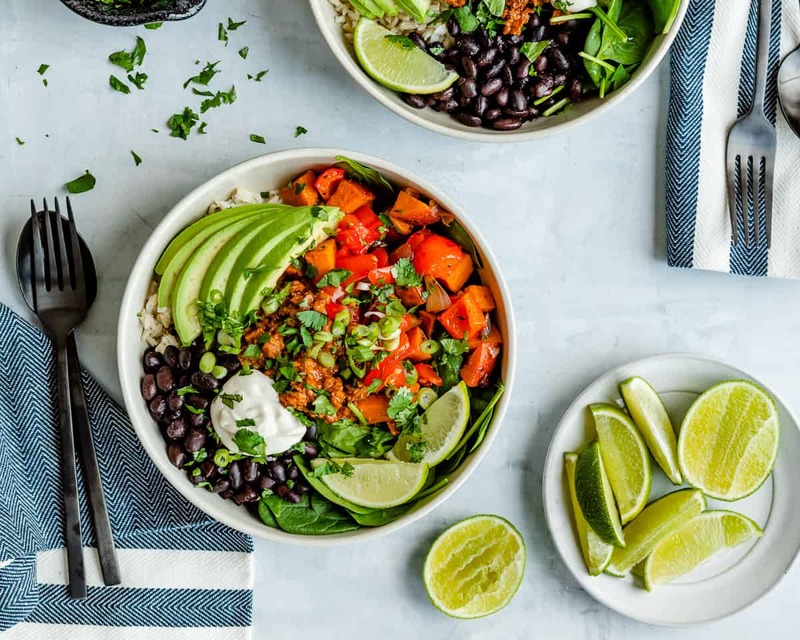 Start your bowl with a base of brown rice (quinoa is my other go-to) followed by spinach, black beans, roasted veggies, and a big scoop of chorizo. Loma Linda Chorizo has a nice meaty texture and flavor that we like even better than traditional chorizo. It can be hard to find good plant-based protein-rich meat substitutes that taste good and don’t contain questionable ingredients. 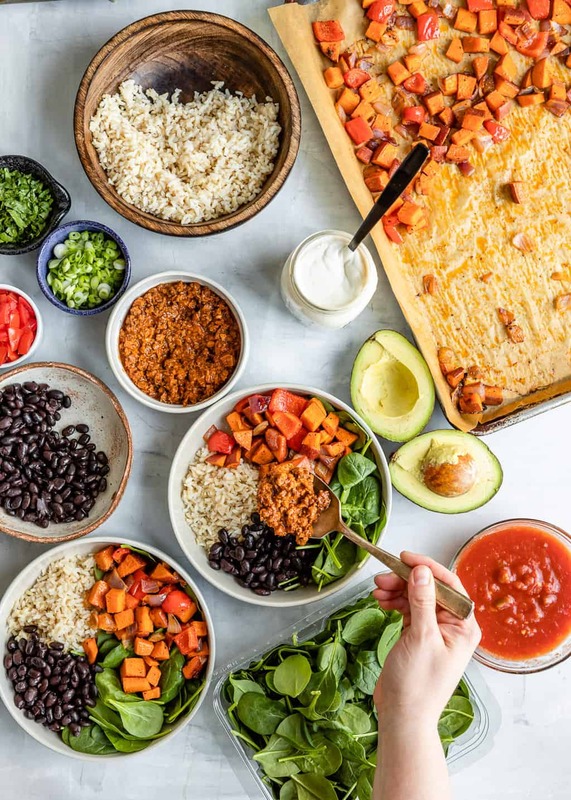 Made from non-GMO soy protein with a mixture of spices, the chorizo adds just the right flavor, texture, and boost of protein these breakfast bowls need. Each serving contains 6g protein, 10% RDV iron along with dietary fiber, potassium, and calcium. Finish building your bowl by adding your favorite combo of toppings. I go all out with plenty of fresh cilantro, a squeeze of lime, sliced avocado, diced fresh tomatoes, green onions, salsa, and sour cream (or a vegan non-dairy alternative). If you aren’t vegan, a fried or poached egg would be another great addition. Oh, and did we mention these bowls are just as satisfying for lunch or dinner too? Preheat oven to 425°F. Line a rimmed baking sheet with parchment. 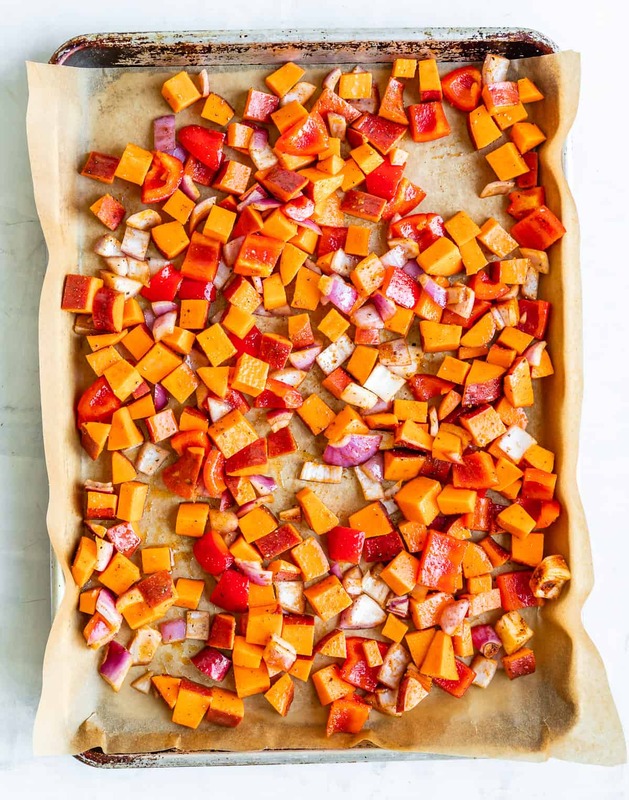 For veggies: Place diced sweet potato on the baking sheet. Drizzle with the olive oil and use your hands to toss until coated. Combine the spices in a small bowl and sprinkle evenly over the veggies. Bake for 15-20 minutes, or until sweet potatoes are tender and golden. Keep warm until ready to serve. While veggies are roasting, prepare the Loma Linda Chorizo according to package directions. Keep warm. Divide the warm brown rice and beans between four bowls, followed by the Chorizo, spinach, and eggs. Serve warm with desired toppings. To make vegan, omit the eggs and use cashew sour cream. To learn more about plant-based protein substitutes, more recipes, and where to find Atlantic Natural Foods Products, visit www.AtlanticNaturalFoods.com.